Design by Alfredo H�berli, 2007. A neutral object for illuminating a wall with elegance, comfort and functionality. Lane is a strip made of aluminum which incorporates and at the same time releases a pleasant indirect light, upward and downward on the wall. 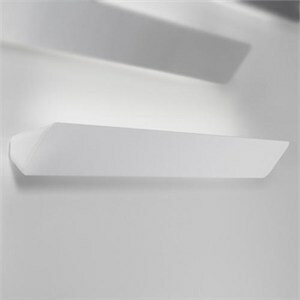 Extremely neat and essential in its shape, Lane is designed with different lengths according to the light source. Available in three lengths. Electronic ballasts. D64/1- 37"L X 3.1"H X 3.5"Extension. Uses 1 X 39W 120V T5HO linear fluorescent lamp (not included). D64/2- 49"L X 3.1"H X 3.5"Extension. Uses 1 X 54W 120V T5HO linear fluorescent lamp (not included). D64/3- 61"L X 3.1"H X 3.5"Extension. Uses 1 X 80W 120V T5HO linear fluorescent lamp (not included). Fixtures are equipped with an additional plate to cover a standard junction box, not pictured. UL and cUL Listed. ADA compliant.